Embroider Buddy® has partnered with Embroidery Soup™ to offer exclusive embroidery charms that are available free with the purchase of Embroider Buddy® stuffed animals. These beautiful charms are another way to easily add a little flair and creativity to your next Embroider Buddy® project! Dozens of designs are available, suitable for many of our buddies. Purchase an Embroider Buddy® from an authorized dealer. 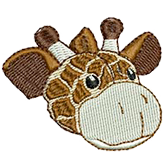 Visit the Embroidery Soup™ web page dedicated to Embroider Buddy® Charms. Register online and then download the free companion designs. Yes, I want a free Embroider Buddy® Charm!